When it comes to managing human sources ( confidential informants, HUMINT ) many of the problems that arise occur because staff involved do not work to a structured system. Our Human Source Management training is based on 4 behavioural models which create a structured pathway to recruit and manage a human source in the most effective and productive way while ensuring adherence to legal and ethical principles. The first of these models (© Buckley and Reid 2005) The Human Source Management Framework is explained below. This model is supplemented by Targeting, Recruiting and Handling models. Need - This is where the intelligence requirement against which the source will gather information is identified. Unplanned Opportunity – An opportunity arises for the handler to attempt to recruit someone who can satisfy the need. This leads directly to the Recruiting Stage where the handler can employ the generic social psychology. Targeting – The targeting of particular potential prospects. This is carried out at two levels social psychological information and the intelligence case. This will allow the handler to develop ‘Targeted Psychology’ for the individual. 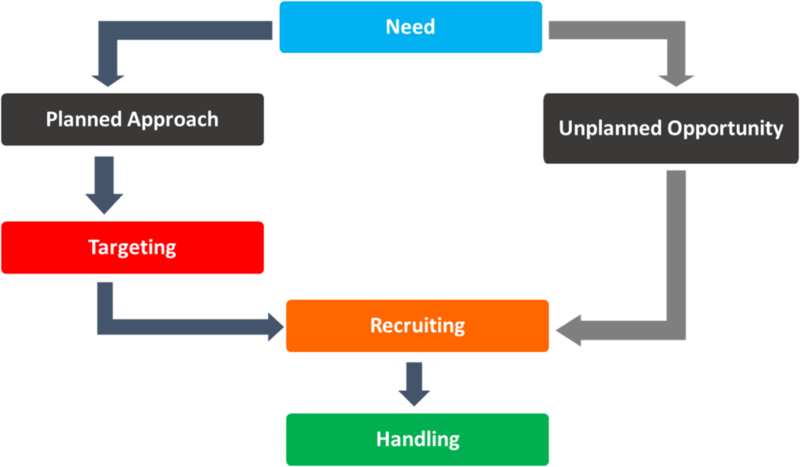 Recruiting – This is the recruitment stage where the handler interacts with the potential source with a view to getting the them to meet with the handler and become a source. Handling – This stage takes the handler from the post recruitment meeting through the development process to the effective use of the source and ultimately to the termination of the source. This simple model provides a structure that guides officers and can indicate what psychological techniques can be used to achieve the best results and when it is the best time to use them. Details of the model and how to use it are contained in the publication The Human Source Management System ( see publications).